Interesting the similarities between him and Obama. Someone definitely to watch. One thing the shadow government is good at is giving people symbols that they can rally around. Did not take me long before noticing that he was in discussions with the think tank Quilliam, whose found Ed Husain left to join the CFR - Council on Foreign Relations. Sure, its not a cast iron connection, but the notion he is just an ordinary working class Brit with no elite connections is laughable. Can anyone propel themselves from convicted hooligan to international speaker overnight without a hidden helping hand ? 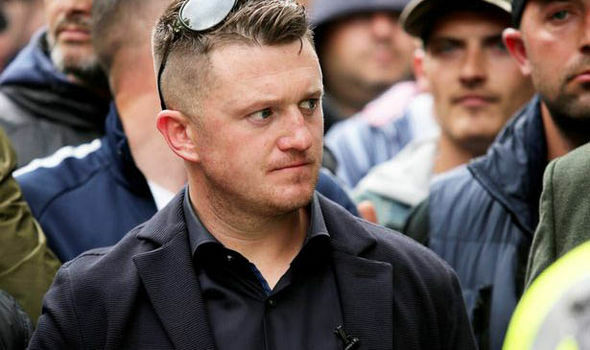 Last but not least the alias "Tommy Robinson", which is alleged to be taken from a football hooligan of local notoriety from a Football Hooligan Firm . . . charming. The very first choice of his political life was the utterly contemptible BNP, British Nationalist Party, the party of choice for british neo nazis, racist skinheads, and other deplorable characters. It was lead by Nick Griffin, who tried to make the party more mainstream and media friendly. Tommy Robinson said, "I didn't know Nick Griffin was in the National Front, I didn't know non-whites couldn't join the organisation. I joined, I saw what it was about, it was not for me"
He seriously made claims about being a Zionist, and when asked played being incredibly ignorant when asked what he thought term zionist meant. Its no wonder that the internet rumour mill has many people accusing him of being a Zionist Agent. . . . While my instinct says he is an Agent procature of some kind, with some hidden hand, I'm sure its a more complex answer than some simplistic label to send people off in a dead of a different type of xenophobia and racist anti-Semitism. Very interesting that media has not exposed his real name yet. Normally, a personal who has numerous identities is treated as either a con artist or some in the intelligence business. Now that you bring up, it is kind of suspicious . . .
Why does Watson and Infowars give the man a free pass and open access to an audience who have absolutely no clue what he represents in uk fringe extremist politics ? This name came up in my travels, looking for the real "Tommy Robinson". I think the answer to the question will come when we know what is the true agenda of Infowars as media company. I thought I knew several years ago, but now I am not sure. My instinct tells me to avoid the zionist path, but to look higher up the food chain. I would hazard a guess, and is just a guess, that the path leads to powerful oligarchs running a neo-con agenda. The leader of the Muslim-hating, neo-Nazi English Defence League, Tommy Robinson, and his deputy Kevin Carroll renounced racism this week. They are leaving the EDL and joining the anti-extremist Quilliam Foundation. But why now, and what is the Quilliam Foundation? And have they really changed? Economic depressions are fertile ground for fascism. In the mid-1930s Lord Rothermere's Daily Mail and Lord Reith's pro-Hitler BBC lent credibility to Jew-hating Nazi blackshirts as they marched through London's East End. Opposing them on the streets were the National Unemployed Workers’ Movement hunger marchers and crowds of decent Londoners let down by a Conservative government that was appeasing Hitler. 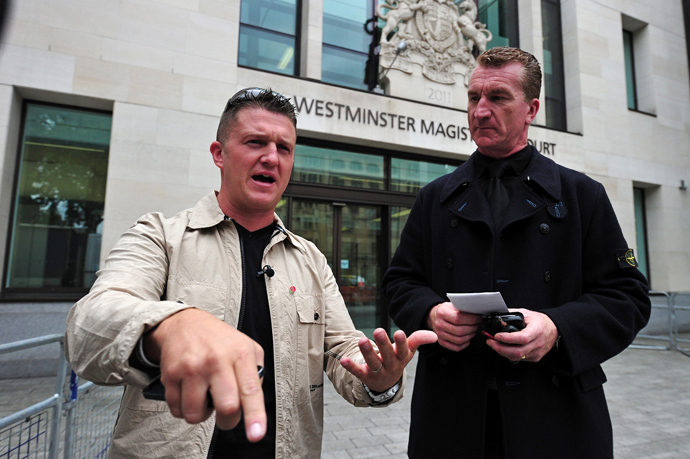 As the Red Cross in 2013 once more begins distributing food to hungry Britons Tommy Robinson, whose real name is Stephen Yaxley-Lennon, is facing criminal charges for obstructing police officers at his own English Defence League demonstration. This took place in the aftermath of May's horrific Woolwich alleged murder of serving soldier Lee Rigby. Was it during negotiations with the police over how these charges would proceed that Tommy was persuaded to jump ship? 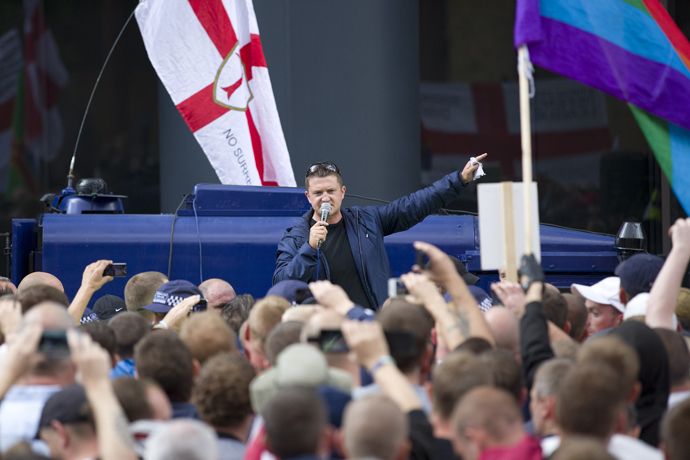 The EDL portrays itself as a grassroots community association, but it would not exist without financial backing from two wealthy individuals who, like Robinson, use pseudonyms to hide their true identity. Millionaire landlady Ann Marchini owns and controls a buy-to-let property empire in Highgate, North London. Said also to prefer pseudonyms, she was a founding member of the abortive far right British Freedom Party and a close friend of its wealthy chairman, former UK Independence Party candidate Paul Weston. The other important EDL funder is “sugardaddy” Alan Ayling, former director of the Pacific Capital investment fund. 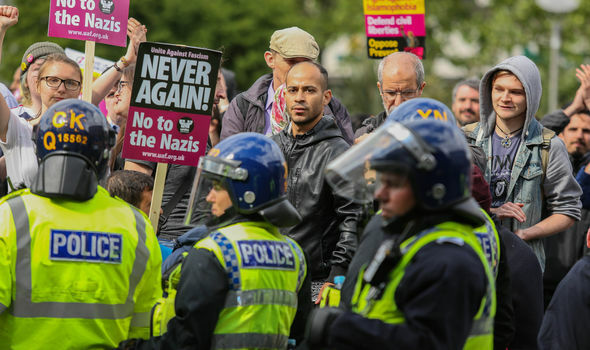 Under the pseudonym Alan Lake, he penned the ominously-named “EDL Final Solution,” which advocates front organizations and illegal activities to undermine Muslims and their representatives. At this week's news conference, Robinson expressed shock and surprise that “Nazis” were appearing at his racist demonstrations, but was his astonishment real? And how real is this Quilliam Foundation that Robinson is moving to? An examination of its longtime spokesman and co-founder, Mohamed Husain, reveals a dubious CV that failed to slow his dazzling career rise through the world of privatized transatlantic foreign policy. Now calling himself Ed Husain, he says he was once a member of pan-Islamic political organization Hizb Ut-Tahrir, a claim they strongly deny. What is known is that Husain landed a job working for the UK Foreign Office-funded British Council in Saudi Arabia. Ed also opposes boycotting Israeli goods, saying that: "Many people condemn Israeli settlements and call for an economic boycott of their produce, but I saw that it was Arab builders, plumbers, taxi drivers and other workers who maintained Israeli lifestyles." In other words, because some Palestinians are being paid as odd-job men for Israelis they can't really want a boycott - a blatant distortion of Palestinian aspirations, remarkably in tune with Zionism and the Global Crusader Movement. As top Quilliam Foundation spokesman, Husain had made it. In the blink of an eye he became an international news commentator. Appearing on CNN, Fox, NPR, BBC and Al-Jazeera, he was published in the New York Times, Financial Times, Guardian, National Review and Jewish Chronicle, to name just a few. Quilliam and Husain became the go-to propagandists for the broadsheets and TV news across Western world for an anti-Islamist Muslim perspective. As a result, the far more accurately representative Muslim Public Affairs Committee (MPAC) or the Mosques and Imams National Advisory Board (MINAB) were sidelined. How Kafkaesque. Indeed, as one of the world's leading independent experts on postmodernism Ravi Zacharius points out, we are living in an age of unbridled mass media where truth, meaning and certainty are systematically undermined. At Quilliam, Husain has shown us how, and now he's been headhunted and his career is really motoring, he's a senior fellow at the big guns of the US Council on Foreign Relations. In the 21st Century there are literally hundreds of think tanks like Quilliam, most funded by funny money from tax exempt “philanthropic” foundations and lobby groups connected to the national private clubs that lay down modern Western foreign policy. It is here where the establishment lays both its colonial plans and its contingencies to muzzle the backlash at home. In the UK, the Royal Institute for International Affairs (RIIA), or Chatham House, based in London's St James' Square, is funded by big business and, obligingly, does the Foreign Office's thinking for it. It creates a business-led, BBC- and crusader-friendly, foundation-funded consensus that the Foreign Office rarely has the courage to question. Husain’s new outfit, the Council on Foreign Relations, has for 90 years made sure US business interests come first at the State Department. Indeed it was the CFR's War and Peace Studies group that in 1943 first suggested a transatlantic elite policy group that emerged a decade later as the notorious Bilderberg Group, founded by a former SS officer. The sumptuous slush funds circulating around these private policy hubs of Chatham House and the Council on Foreign Relations fund so much professional-looking globalist policy “chaff” that any genuine expert sentiment or overtures to détente are consistently drowned out. Postmodern think tanks like Quilliam deconstruct and repackage the legitimate voices, in this case from Britain's Islamic community. They decide what Muslims ought to have said and, pretending to be Muslims, say it for them for the world to hear. Zionism and the Global Crusader Movement see the world in these terms. Through their influence in finance and the mass media they steal, synthesize and repackage views that oppose their War on Terror throughout the NATO-zone mainstream media, systematically skewing and dumbing down the entire national and international debate. Gone from the discussion is the right of occupied nations to self-defense and respect for the global rule of law. Gone too are the stunning similarities, pointed out in 2008 by former Archbishop of Canterbury Rowan Williams, between genuine Sharia law and Britain's own, all-but-forgotten, Canon law, which is still in force. 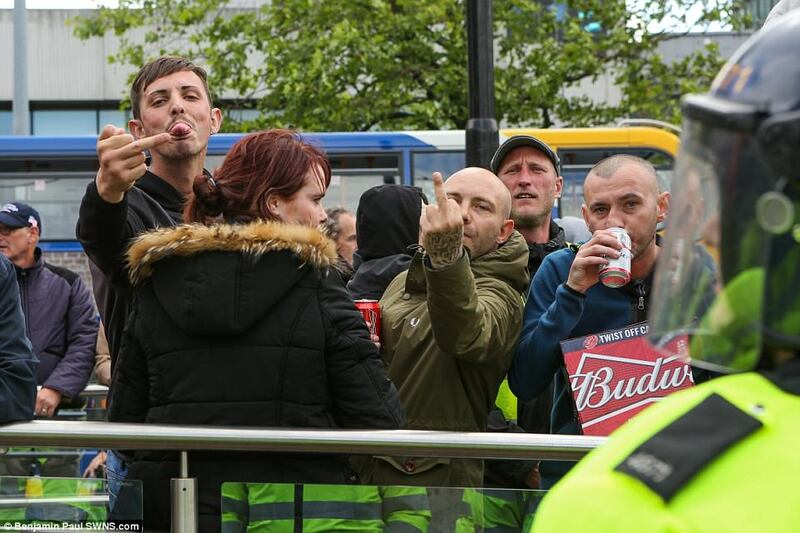 The EDL’s Robinson and Carroll have merely been nudged upstage from one front organization (that would have no credibility, but for the platform given it by the mainstream media) to another. Robinson has merely gone from overt racist to covert racist; from black propaganda to gray propaganda. As in the 1930s, the far right, both in its street thug and more respectable forms, is only a hair's breadth from the British establishment. Hanging in Winston Churchill's old country home dining room in Kent you'll find one of his own paintings, “Tea at Chartwell” which he modeled on a contemporary photograph. Sitting round the table with the man who was later to become Britain's wartime prime minister is a frequent visitor to Churchill's country home, Diana Mitford. Mitford was soon to marry blackshirt-in-chief Sir Oswald Mosley on a visit to the German home of Nazi propaganda chief Josef Goebbels. Guest of honor at that happy occasion was none other than Adolf Hitler himself. So Robinson has gone from street fighting thug to globetrotting propagandist in a day. As this puppet of Britain's crooked establishment is reinvented for the London media, he should find those criminal obstruction charges from his last race riot will be conveniently dropped. We shall see. The more I dig the more prophetic that statement becomes.... like they are all using pseudonyms, and not for artistic reasons. This is getting really weird . . . talk about a Rabbit Hole. In 2012, Moore expressed her support for Norwegian extremist Anders Behring Breivik, who in July 2011 murdered dozens of people in the name of protecting Europe’s Christian identity from an imagined Muslim takeover. A property tycoon and a City-based financier quizzed by police over his links to the gunman who slaughtered 69 people in Norway are exposed today as key figures behind the rise of the far-right English Defence League (EDL). A Sunday Times investigation has revealed that Ann Marchini, a mother from Highgate, north London, and Alan Ayling, a former director of an investment fund, have sought to mould the thuggish anti-Muslim group into a credible political force. They are both linked to the murky world of the online “counter-jihad” movement from which Anders Behring Breivik drew ideological inspiration before committing his massacre in Norway in July. They have remained in the shadows until now by using aliases on the internet to mask their true identities. We know of the groups that western government train and finance in Middle East and Africa, ISIS, Al Queda, Al Nusra, etc. But as of late there is very little thorough and sourced analysis of counter movements that spring up in response to the actions of these groups. We can never forget that shadow government founds both sides of war. Behind most manufactured movements is a financier. Thanks for shining light on this. I thought it would just half a dozen video clips, but it rapidly became a thread in its own right. In attempt to be fair, I simply picked one City that I was familiar with and thought I would simply post what I could find on YouTube. Thinking that I would end up with video for and against . 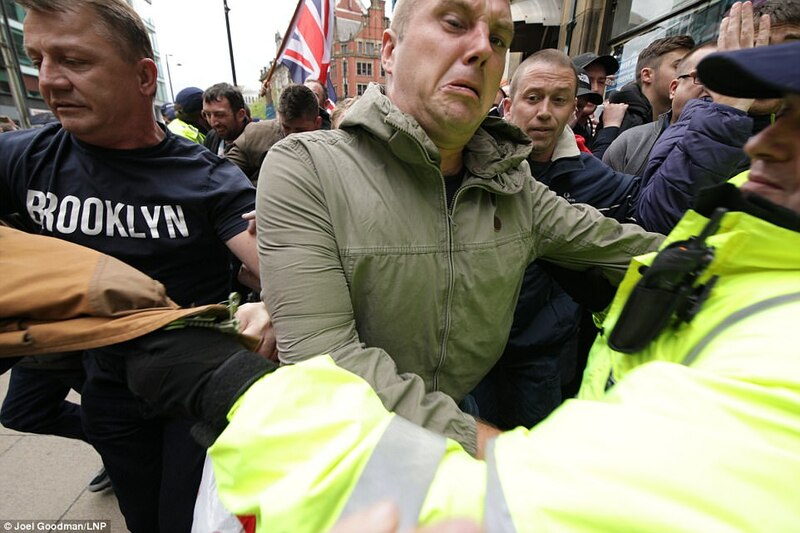 . . some from EDL supporters, and some from the Anti-Nazi league. Then people could make their own minds. After posting 12 videos, it became obvious the size of the task was a wee bit bigger than I thought. Looks like he is a serial rebrander - he rebranded himself literally by changing his name..and taking the name of some football hooligan from Luton? What a ludicrous tool. He then apparently rebranded himself on various occasions to keep the worst of society's opproprium at bay while still being able to spin his racist yarn. He is obviously right at home on Infowars, and it's unsurprising that Watson and Jones fawn all over such a miserable weasel. It is also unsurprising to read that he has zionist funding - his anti-muslim rhetoric is so ridiculously over the top. Regardless, he is right about what is happening in the UK and what is potentially happening in the US. These people have been let in on purpose to cause chaos and chaos is what is happening, is it not? The globalist want chaos so the people can demand that government do something about it, even though it was government who implemented it to begin with. Tommy has been pointing it out. 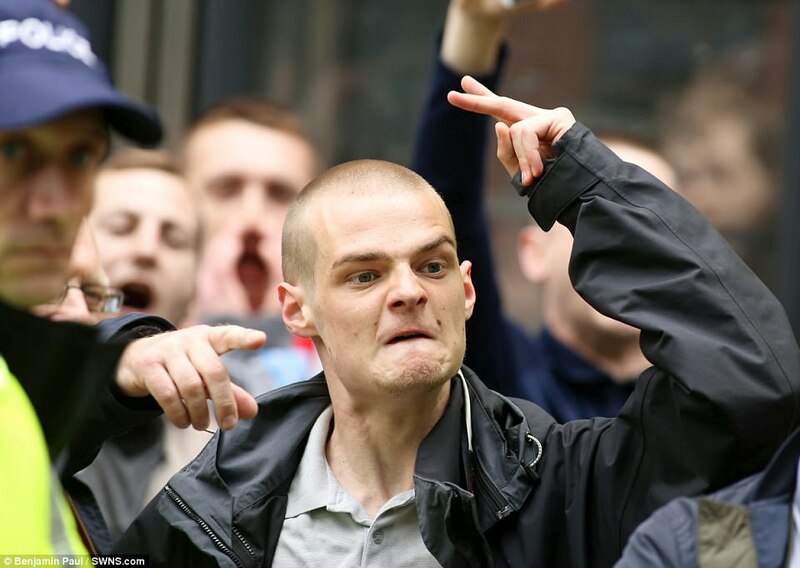 Although there are plenty of stories about travelling with England football hooligans as a youngster, Tommy probably plays down the extent of his involvement in the football scene. He essentially ran the Luton FC football firm; and a lot of his associates have served time for firearms offences, GBH, drugs and the rest. As he breezes through all this, you wonder if a few details might be conveniently left out. 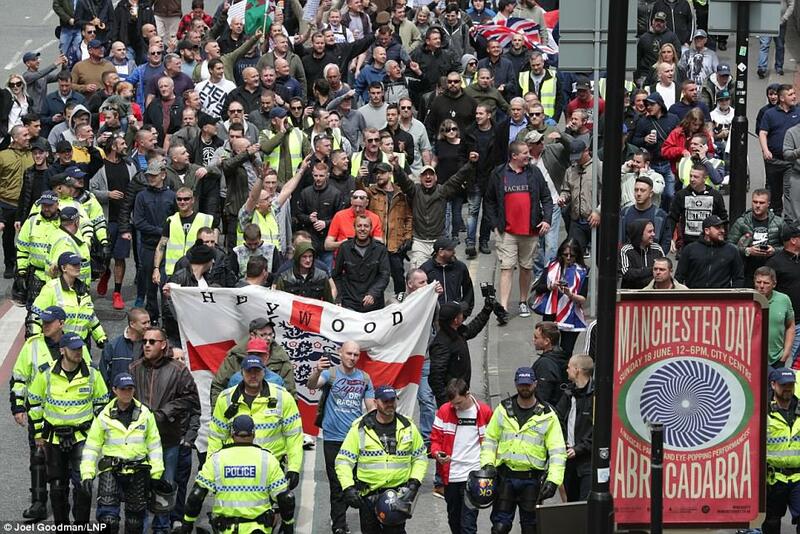 But on the other hand, loud, drunk EDL demos, which often did contain far-right elements, caused huge disruption and difficulty. 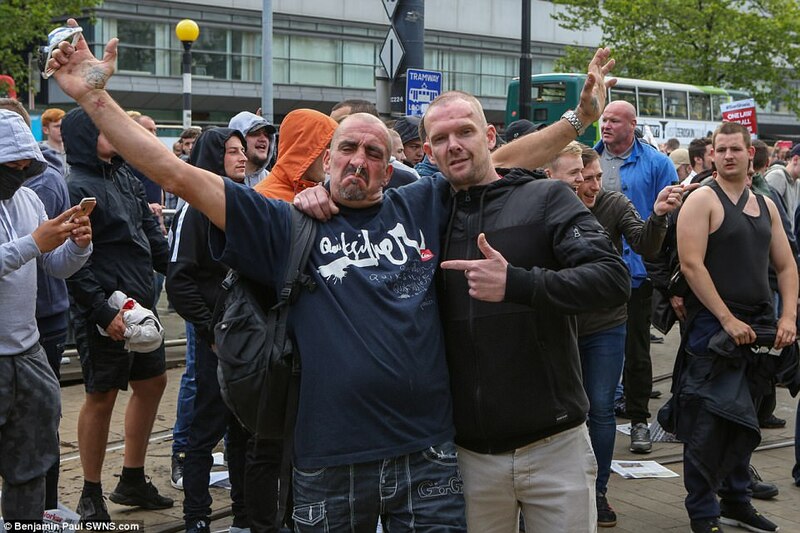 I don't think Tommy ever quite appreciates how it might feel as a peaceful, decent British Muslim having your town descended upon by aggressive blokes chanting obscenities about your religion. That can (and probably did) make Britain a more fractious place to live. It possibly even turns more moderate Muslims towards the very extremism the EDL said they were complaining about. 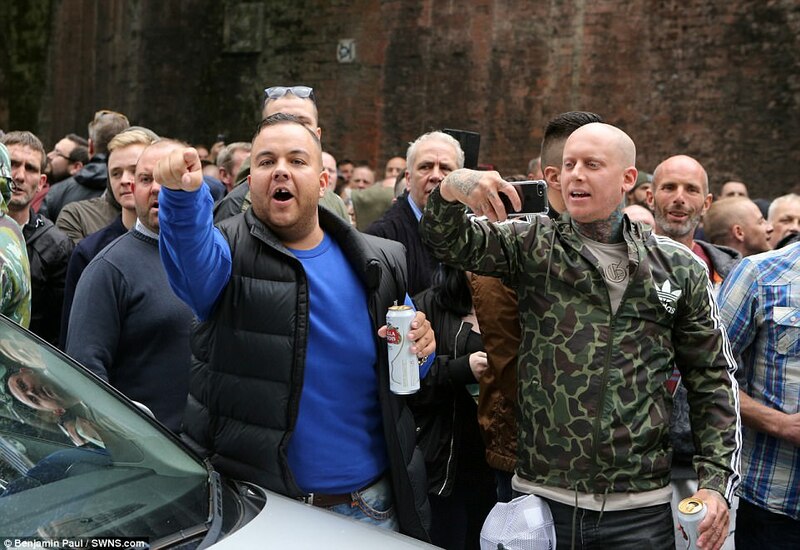 Hundreds of far-right protestors led by former EDL leader Tommy Robinson clashed with police while taking part in what was intended to be a 'silent' rally. 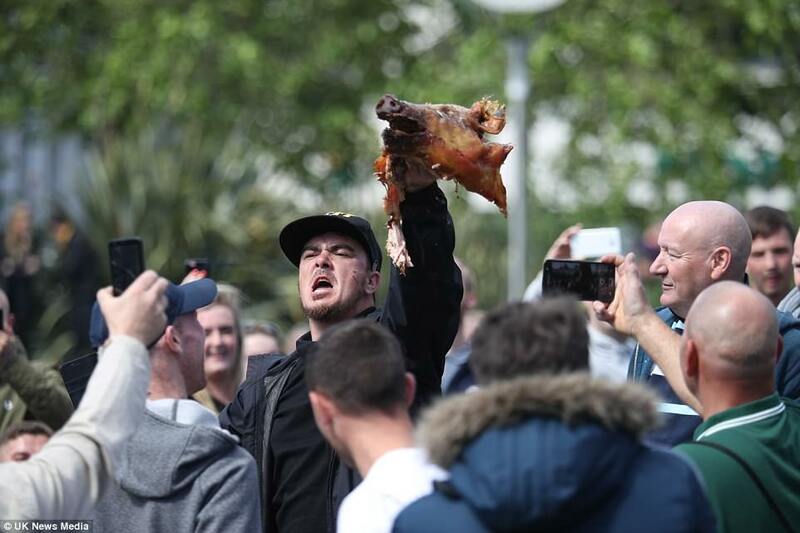 But the rally quickly turned violent, and the far-right protestors scuffled with police and left-wing activists - and even brandished a pig's head and took turns taking bites out of it. The group, called UK Against Hate, carried out the demonstration in response to the terrorist attack in Manchester last month. Salman Abedi, 22, detonated an improvised explosive device after an Ariana Grande concert at the Manchester Arena and killed 22 people - including children. 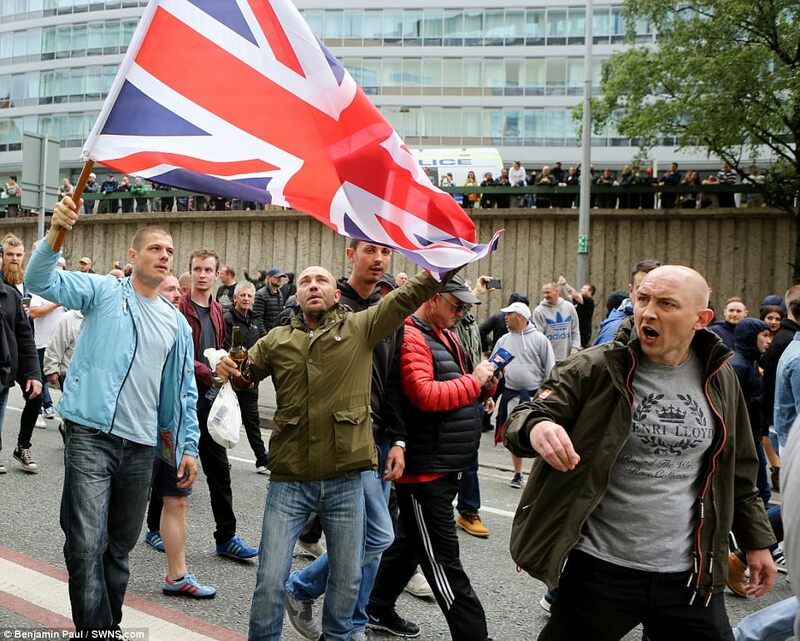 And on Sunday, the protestors, said their march from Piccadilly Train Station to a rally in Piccadilly Gardens in the city was their response to the attack. But the silent march turned 'nasty' when a number of the group tussled with police who had attended the march to make sure it was 'peaceful'. 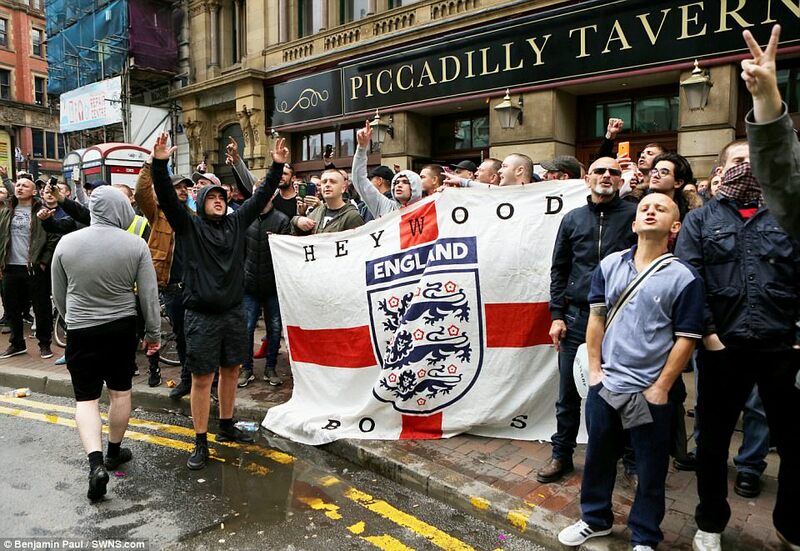 Some of the group - which is made up of mostly young men - carried giant England flags during the protest. 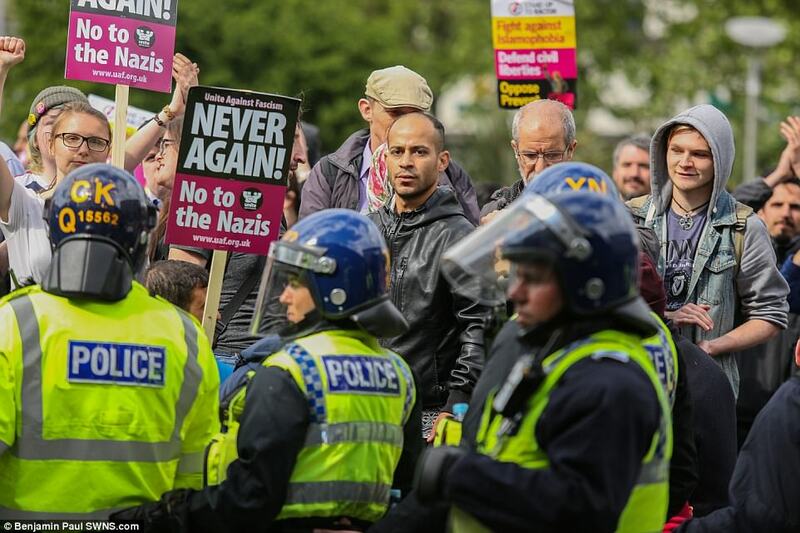 The protestors was later opposed by a counter demonstration which involved a collection of anti-fascist groups. 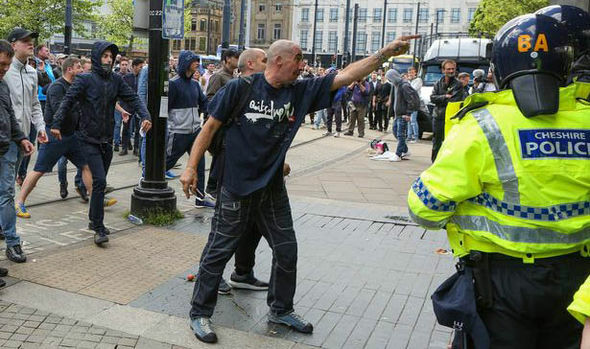 It is not clear whether any of those in the city were injured or if anyone was arrested by Greater Manchester Police. 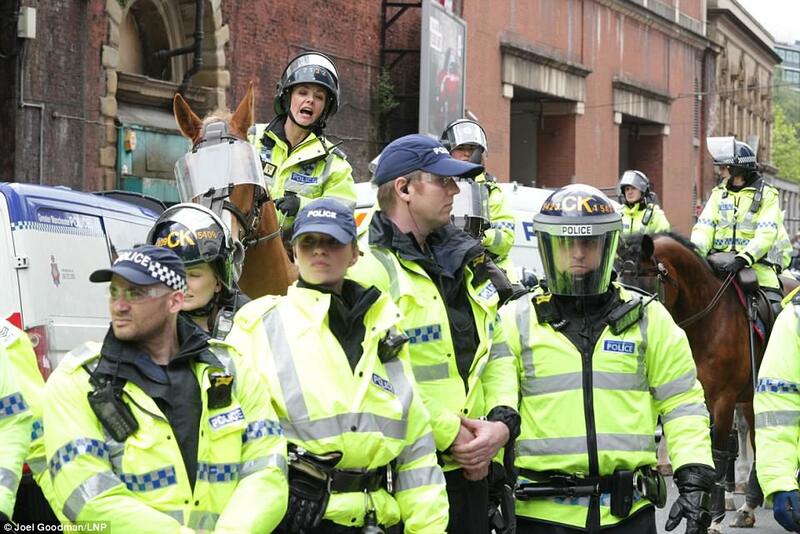 This was the moment shouting demonstrators overpowered police, knocking officers to the floor in Manchester city centre. 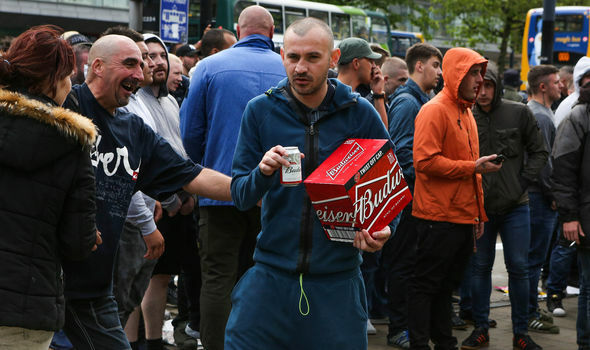 Some of the protesters cheered and held beer cans aloft as they broke through the GMP line on Station Approach, near Piccadilly Gardens, on Sunday afternoon. Two officers in hi-vis jackets were shoved to the pavement as a stream of demonstrators ran through. 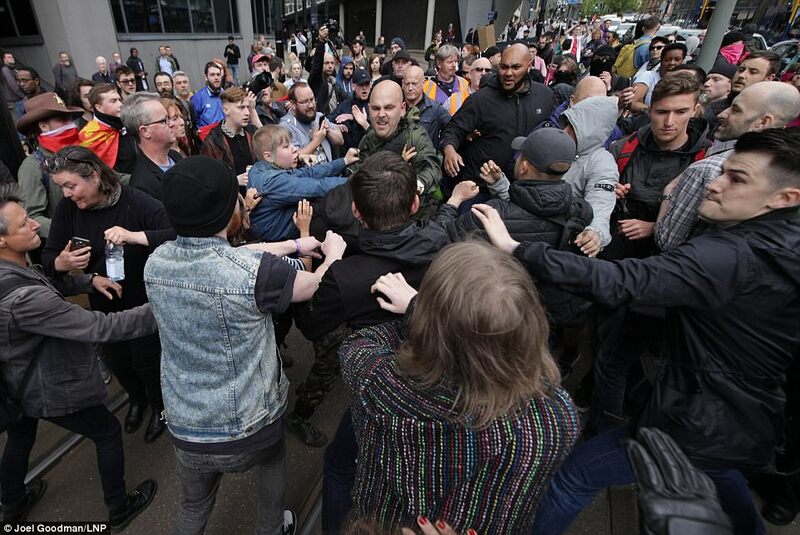 Officers grappled with several people as they fought to keep the group contained. 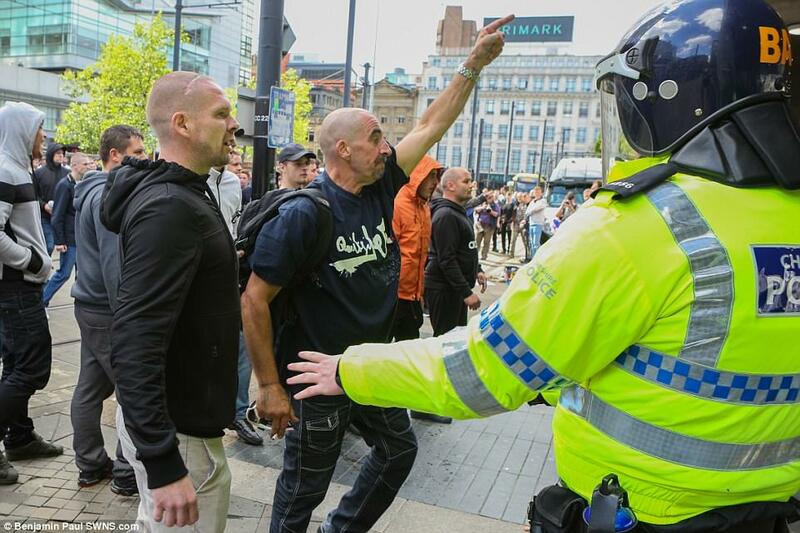 Police urged people to avoid Piccadilly Gardens and surrounding streets on Sunday afternoon as the protest, organised by former EDL leader Tommy Robinson, brought disruption to the city centre. Some trams and buses were diverted as hundreds of people marched from Manchester Piccadilly Station to Piccadilly Gardens. 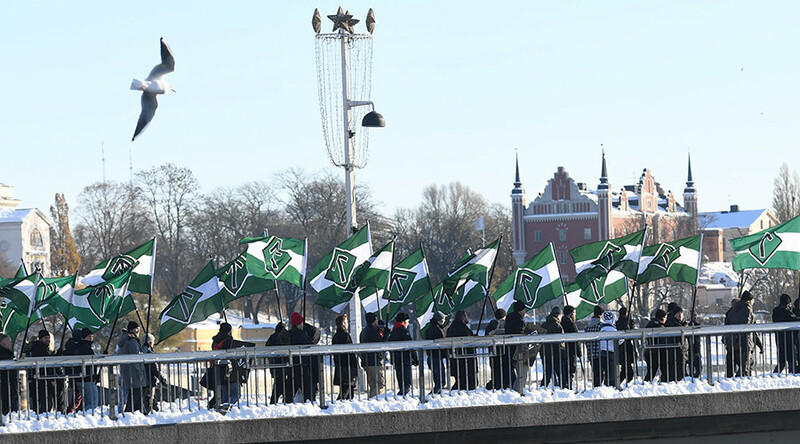 The demonstrators were met in the public plaza by a group of anti-protesters, who were also carrying banners. After the crowds thinned out, transport bosses slammed 'a small minority' who showed 'complete disregard for the travelling public'. 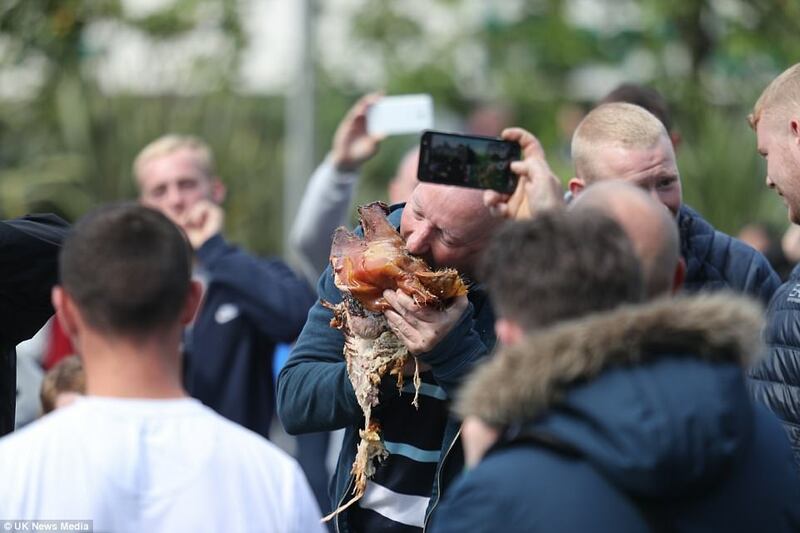 John Fryer, TfGM's Transport and Event Planning Lead, said: 'The demonstration in the city has added to an already busy weekend for the transport industry across the region. 'A small minority of those in attendance have shown a complete disregard for the travelling public and by their actions have made it clear that their sole intention was to cause trouble and be as disruptive as possible. 'We've been working extremely closely with the police and operators across the weekend to ensure we had the right plans in place to support festival goers as well as all those coming in and going out of the city for work, retail or leisure purposes, but clearly blocking tram tracks and roads has meant some of these services have been affected. 'Our transport coordination centre enables us to work closely and collaboratively with our partners and I'd like to thank them for their continued efforts in ensuring the tens of thousands of people attending Parklife have got their quickly and on time and for their quick responses during the protest, as some of the contingency plans put in place enabled us to keep people moving on a very challenging afternoon. 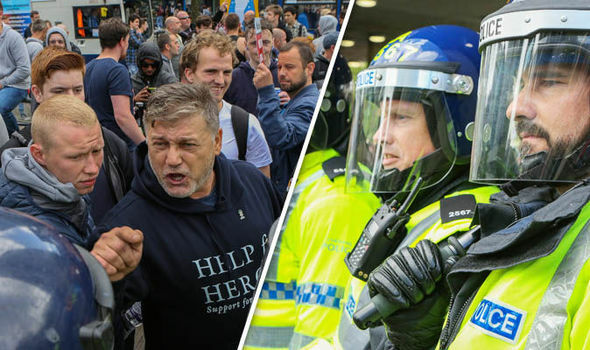 Smoke canisters and bottles were thrown during an ‘incredibly challenging day’ for police officers as a demonstration by the English Defence League (EDL) ‘turned nasty’. 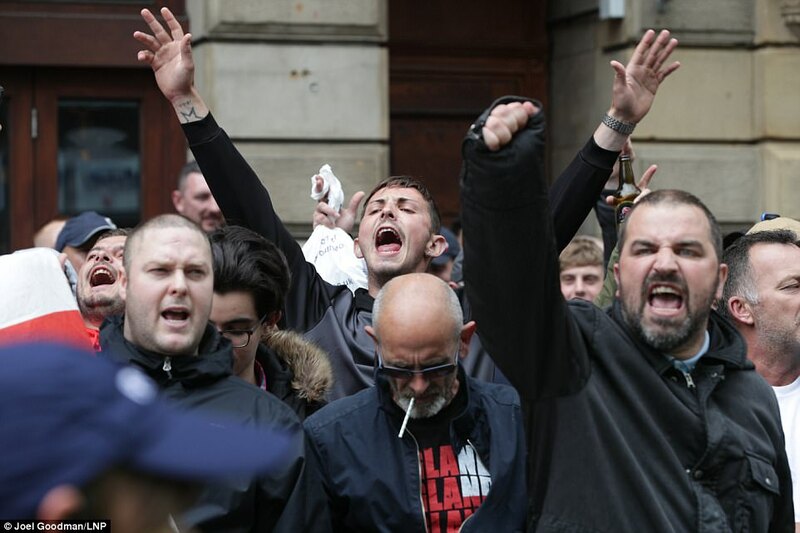 About 1,000 supporters of the right-wing group, including the EDL’s former leader Tommy Robinson, converged on Manchester city centre in what they billed as a march against ‘the establishment’s tolerance of hateful ideology’. 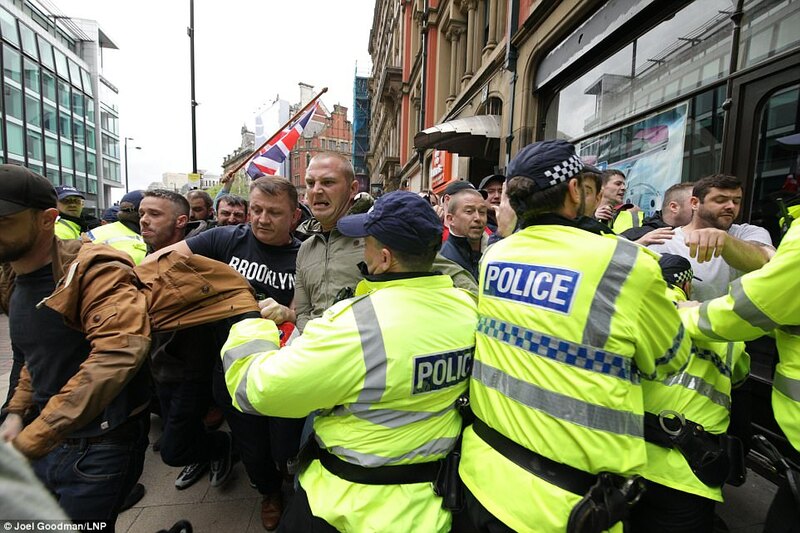 Their presence led to angry clashes with demonstrators and anti-facist groups forcing Greater Manchester Police officers to use riot gear to keep the sides apart. 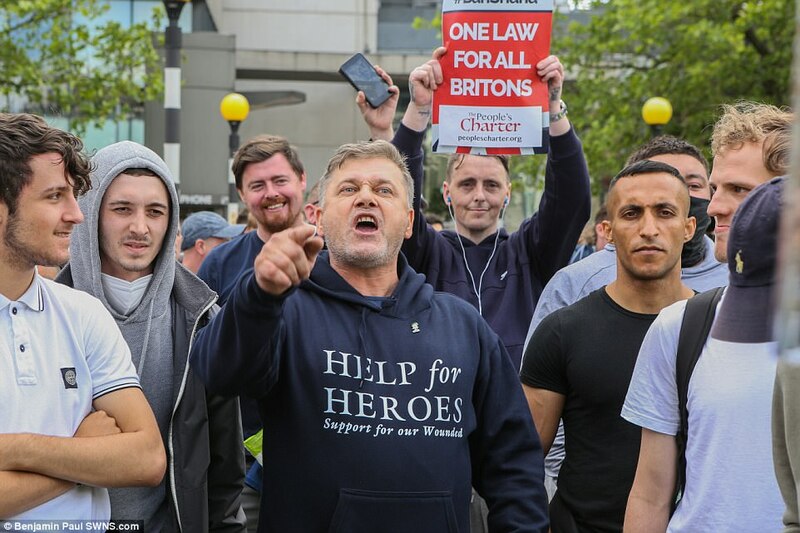 The rally led to the EDL being criticised for wasting police time in the wake of the Manchester Arena bombing. Greater Manchester Police Chief Superintendent John O’Hare said: ‘This has been an incredibly challenging day with thousands of people attending Manchester City Centre for the protest. ‘I understand that these events are very emotive and that tensions run high when there are polarised views and counter-protests. ‘Our city has been through a lot over the last few weeks and I know there were people opposed to the event taking place. 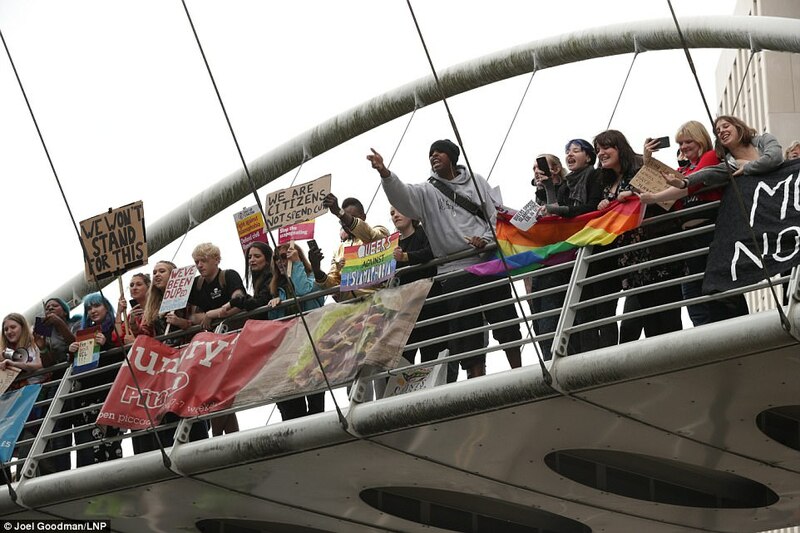 ‘We have worked closely with Manchester City Council, our key partners and the wider community to find the most effective way to facilitate and manage this protest in a balanced and safe manner. ‘In order to ensure we could deliver a safe operation we deployed over 400 police officers, including support from other forces. ‘This meant another busy weekend for our people who have worked considerably long hours in extremely challenging circumstances for no other reason other than to look after our communities. They added that anyone concerned should speak to officers at the scene or call 101. 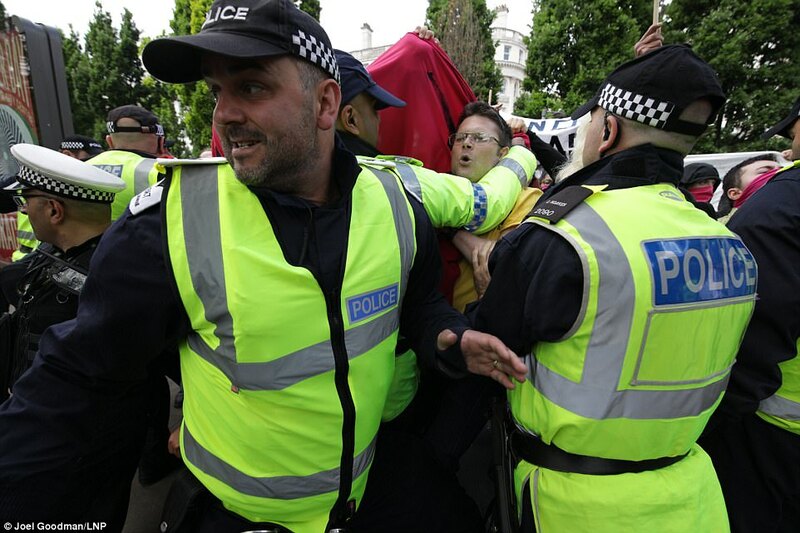 SMOKE canisters and bottles were thrown at police this afternoon as protestors clashed during a demonstration by a group called UK Against Hate. 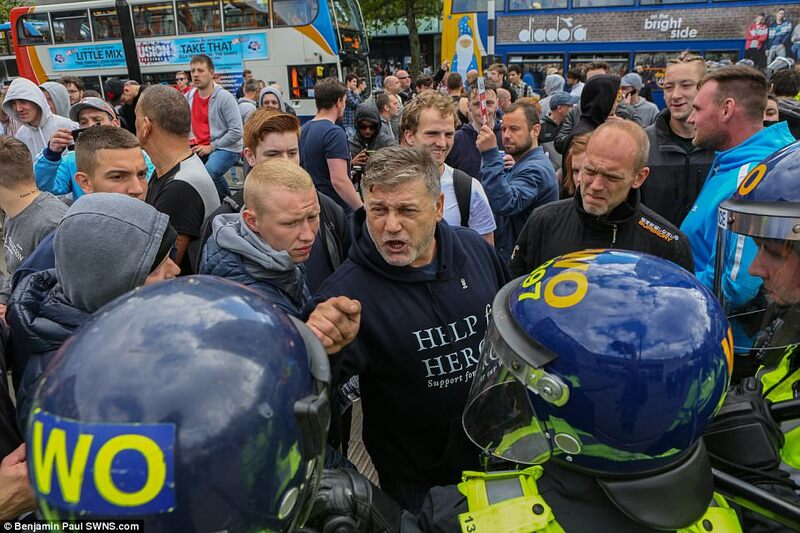 Officers in protective gear were pictured at the scene in Manchester, as they struggled to keep apart the UK Against Hate protestors led by former EDL leader Tommy Robinson and a counter protest that sprung up in opposition. 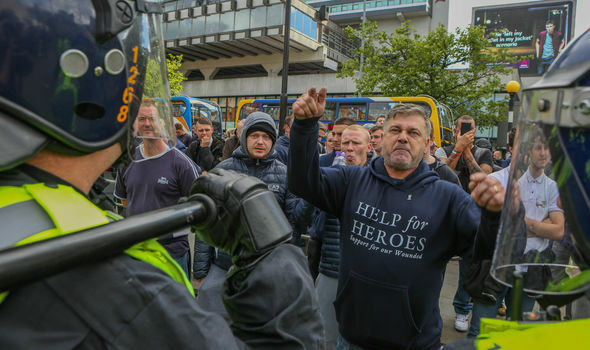 Hundreds of far-right supporters converged on the centre of Manchester for the protest in Piccadilly Gardens which allegedly “turned nasty” very quickly. 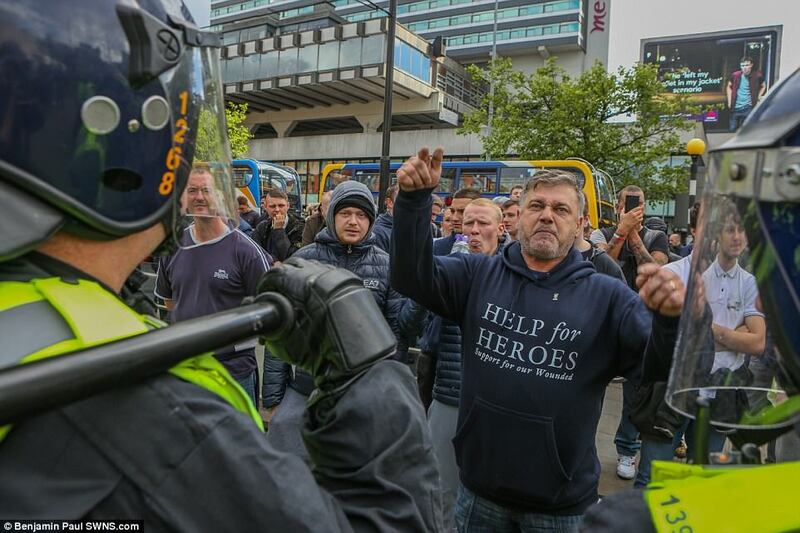 The group's presence led to fiery clashes with demonstrators and Anti-Facist groups as Greater Manchester Police officers in riot gear tried to separate demonstrators. Footage of some of those attending the rally can be heard chanting: "E-E-EDL" and "Allah, Allah, who the f*** is Allah?" Eight arrests were believed to have been made during the afternoon - with some protestors accusing demonstrators of using pepper spray on them. GMP issued a statement on Twitter on Sunday, which read: "There is a demonstration taking place in Piccadilly Gardens this afternoon, please avoid the area if possible until protesters have finished." 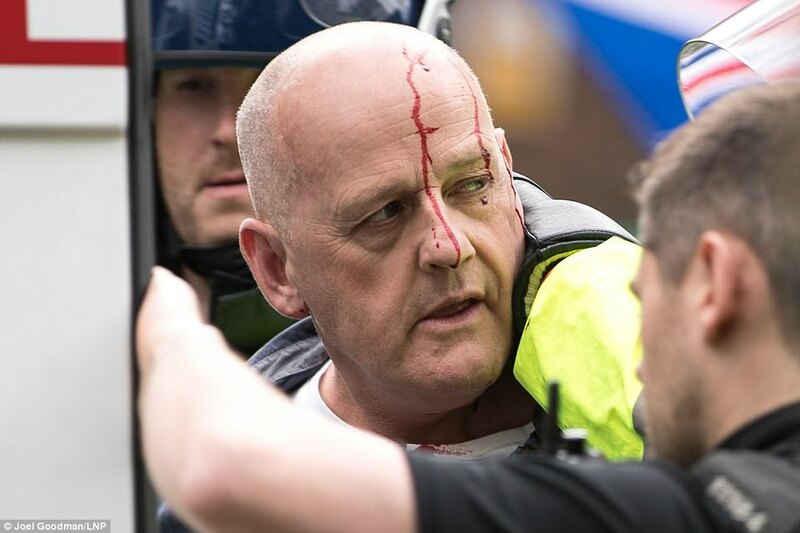 Officers from GMP's City Centre division also tweeted at 3.20pm saying: "Please avoid Piccadilly Gardens area, as a protest has turned nasty. Some disruption to public transport too." They warned people to stay away from the city centre and added that anyone concerned should speak to officers at the scene or call 101. Around 400 police officers, including support from other forces, were deployed to the scene to try and quell the violence. Chief Superintendent John O’Hare said: “This has been an incredibly challenging day with thousands of people attending Manchester City Centre for the protest. “I understand that these events are very emotive and that tensions run high when there are polarised views and counter-protests. “Our City has been through a lot over the last few weeks and I know there were people opposed to the event taking place. 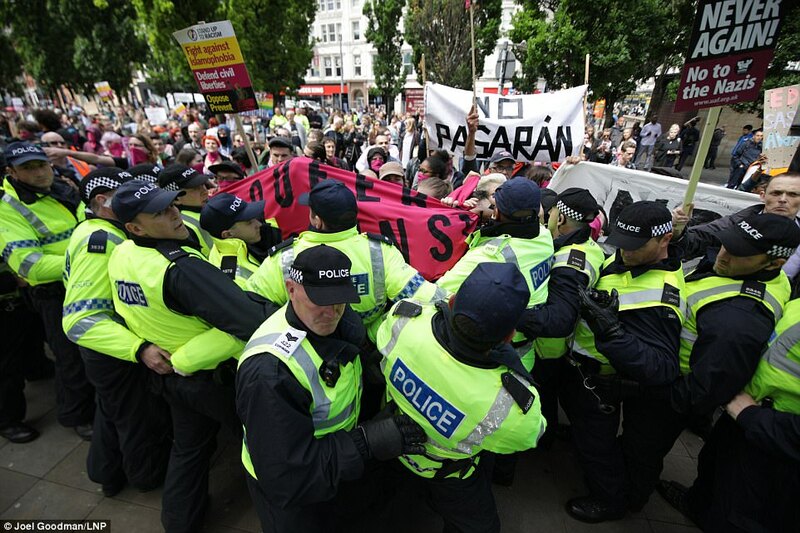 “We have worked closely with Manchester City Council, our Key Partners and the wider Community to find the most effective way to facilitate and manage this protest in a balanced and safe manner." Along with the chaotic scenes of violence, the protest caused major disruption to the area. Transport bosses also warned of “major disruption” to buses and tram services, according to the Manchester Evening News . And Metroshuttle tram services were completely suspended at one point during the afternoon. At around 4.45pm, police reported that the protest had finished, but officers were still helping groups out of the area. 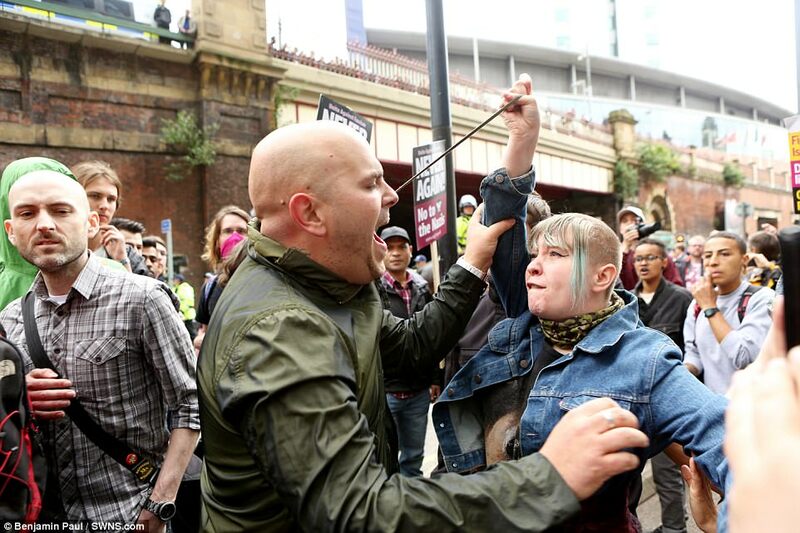 Police have arrested eight people after a protest in Piccadilly Gardens in Manchester city centre earlier today after a protest 'turned nasty'. They had urged the public to stay away from the area this afternoon. 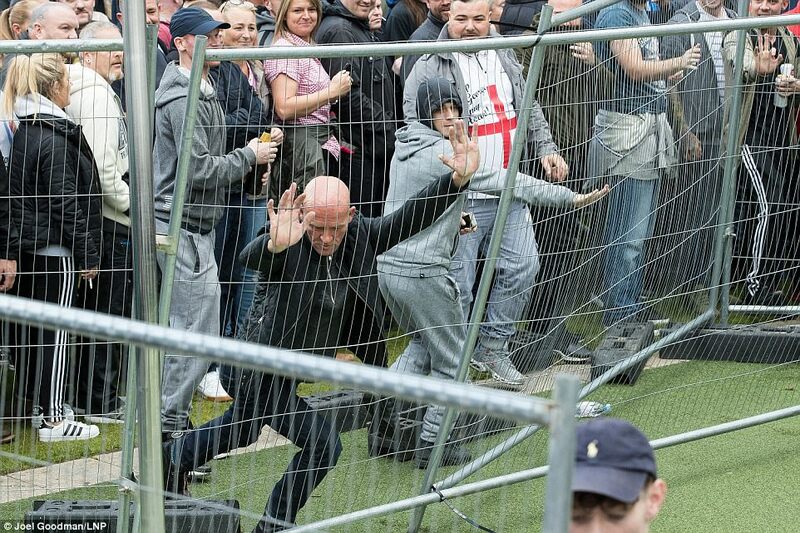 Officers in protective gear were at the scene and eyewitnesses reported smoke canisters and bottles being thrown during the fracas, which was led by former EDL leader Tommy Robinson. 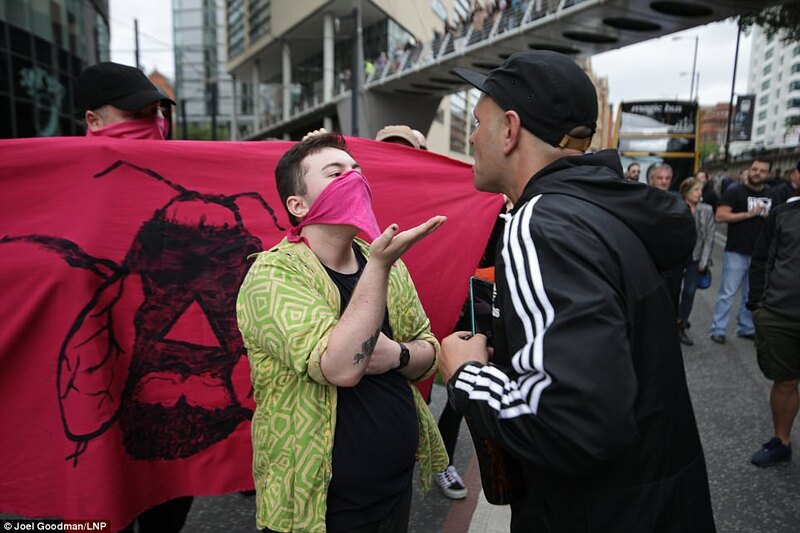 Greater Manchester Police were attempting to keep two groups of protesters and anti-protesters away from each other on Sunday afternoon. Transport bosses also warned of ‘major disruption’ to buses and tram services, reports the Manchester Evening News . Metroshuttle tram services were completely suspended at one point during the afternoon. They added that anyone concerned should speak to officers at the scene or call 101. Transport for Greater Manchester tweeted shortly before 2pm: “There is currently a major disruption in the city centre. Please avoid the centre if at all possible. A police helicopter was also spotted circling above the scene. At around 4.45pm, police reported that the protest had finished, but officers were still helping groups out of the area. MEN reporter Rebecca Day shared pictures of demonstrators outside The Waldorf, a nearby pub, saying the atmosphere was "very heated". Riot police have also been pictured outside the establishment. 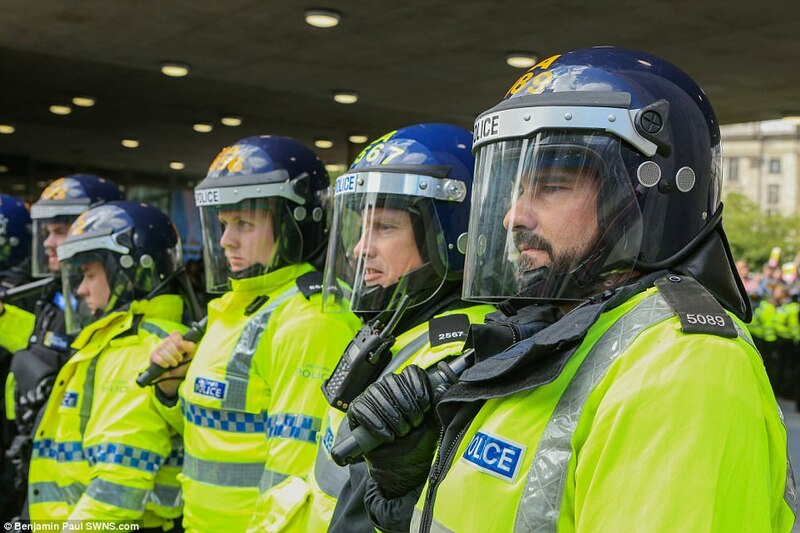 Chief Superintendent John O’Hare said: “This has been an incredibly challenging day with thousands of people attending Manchester City Centre for the protest. “I understand that these events are very emotive and that tensions run high when there are polarised views and counter-protests. “Our City has been through a lot over the last few weeks and I know there were people opposed to the event taking place. 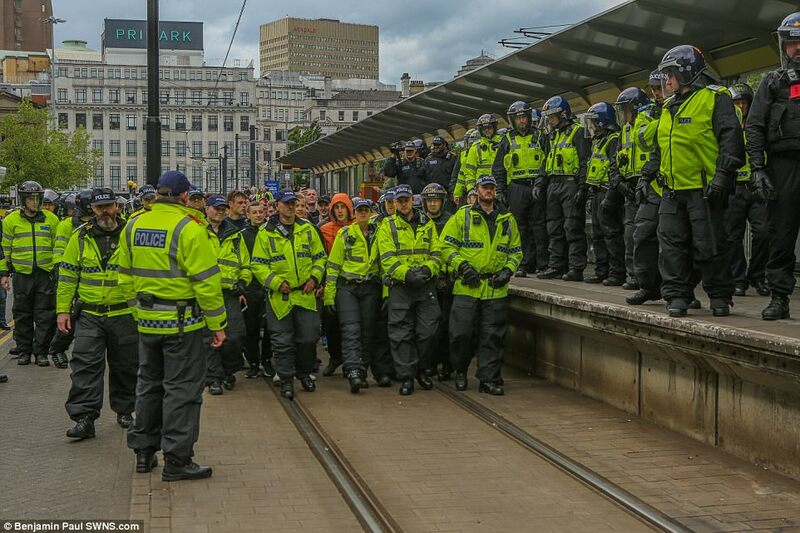 “We have worked closely with Manchester City Council, our Key Partners and the wider Community to find the most effective way to facilitate and manage this protest in a balanced and safe manner. “In order to ensure we could deliver a safe operation we deployed over 400 police officers, including support from other forces. “This meant another busy weekend for our people who have worked considerably long hours in extremely challenging circumstances for no other reason other than to look after our communities. 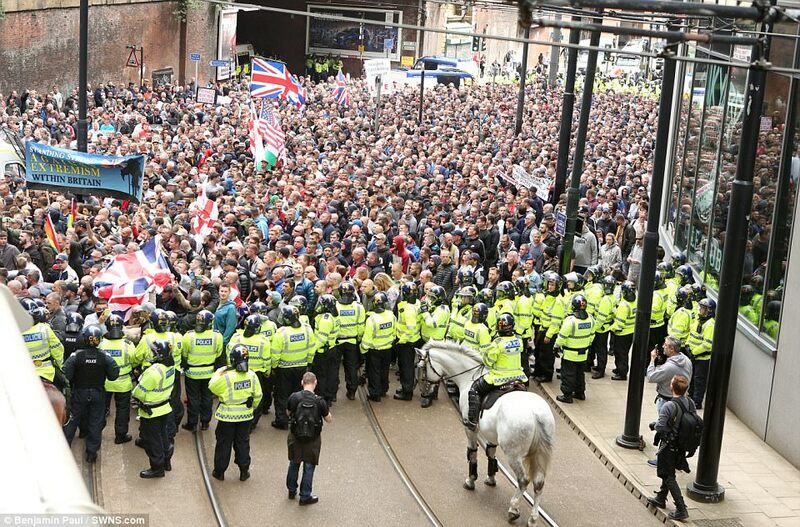 “There have been eight arrests for public order offences, which is not uncommon for a demonstration of this size. 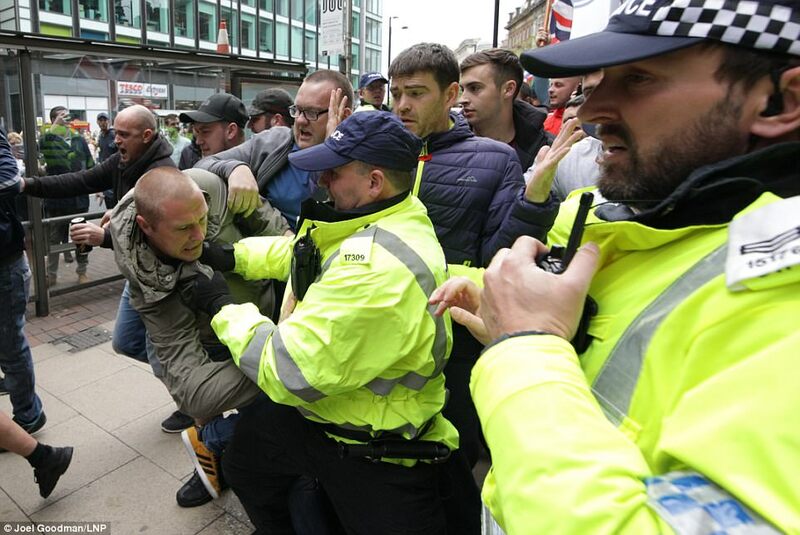 “It was pleasing to see that this protest did not stop the people of Manchester from going about their normal Sunday activities.” John Fryer, TfGM’s Transport and Event Planning Lead, has slammed ‘a small minority’ who caused trouble and disruption in the city centre today. The demonstration in the city has added to an already busy weekend for the transport industry across the region. 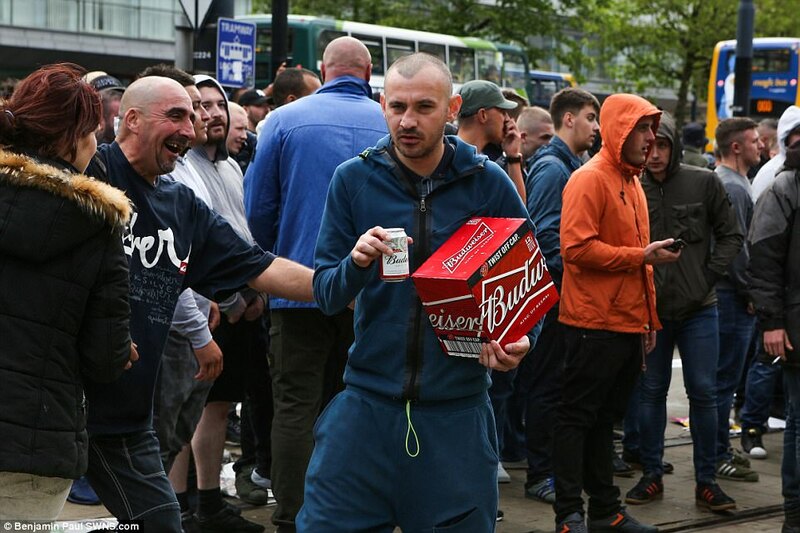 "A small minority of those in attendance have shown a complete disregard for the travelling public and by their actions have made it clear that their sole intention was to cause trouble and be as disruptive as possible. "We’ve been working extremely closely with the police and operators across the weekend to ensure we had the right plans in place to support festival goers as well as all those coming in and going out of the city for work, retail or leisure purposes, but clearly blocking tram tracks and roads has meant some of these services have been affected. "Our transport coordination centre enables us to work closely and collaboratively with our partners and I’d like to thank them for their continued efforts in ensuring the tens of thousands of people attending Parklife have got their quickly and on time and for their quick responses during the protest, as some of the contingency plans put in place enabled us to keep people moving on a very challenging afternoon." Following 3 Islamic terror attacks in the UK that killed almost 50 & injured hundreds, there has been no "Islamophobic" backlash whatsoever. His city was just hit by a massive Islamic terror attack and yet he&#39;s whining about people on a "march against terror".